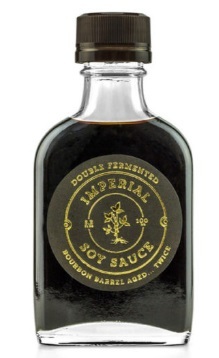 Imperial Double Fermented Soy Sauce is naturally brewed and double fermented for a richer, fuller flavor. The complex fermentation begins with a Bluegrass Soy Sauce brine combined with more non-GMO soybeans, soft red winter wheat, and aged for an additional six months in bourbon barrels. Full-bodied and thick with earthy flavors ranging from coffee, and molasses to dark chocolate, use Imperial Double Fermented Soy Sauce to season broth or noodles. The vibrant, luxurious texture is perfect for dipping sushi and making dressing.